The IGLTA Foundation supports the mission of IGLTA and its members through education, research and leadership development that benefits the global LGBTQ+ tourism industry. Wouldn't It Be Nice If Everyone Felt Welcome To Explore It? Learn More about the IGLTA Foundation - Click Here. Founded in 2012, the IGLTA Foundation is the 501(c)3 public charity subsidiary of the International Gay & Lesbian Travel Association. The IGLTA Foundation supports initiatives for industry organizations, leaders and communities to advance LGBTQ+ travel around the world. The IGLTA Foundation educates governments and tourism industry leaders on the importance of making LGBTQ+ travelers feel safe and welcome. The IGLTA Foundation provides resources for IGLTA to engage with other non-governmental organizations as well as governments and tourism boards to speak on the positive economic and cultural impact of LGBTQ+ tourism. The IGLTA Foundation is also an official partner of ECPAT (End Child Prostitution And Trafficking) International. IGLTAF also funds IGLTA memberships for LGBTQ+ small tourism business owners in emerging destinations lacking governmental or industry support. Since 2012, Association memberships have been funded for small businesses in Cambodia, China, Colombia, Ecuador, Indonesia, Jamaica, Montenegro, Peru, Romania, Serbia, Singapore, Sri Lanka, Trinidad and Vietnam. The IGLTA Foundation funds research to promote understanding of LGBTQ+ travel within the global tourism industry. The IGLTA Foundation funds IGLTA to collect and disseminate quality industry research from trustworthy sources around the world. This research not only provides invaluable demographic information to better serve LGBTQ+ travelers but also compelling economic data that illustrates the value of supporting our market. IGLTAF also funds original research on issues affecting the LGBTQ+ travel industry where no current, credible research exists. We will share these key findings to continuously improve the state of LGBTQ+ travel around the world. 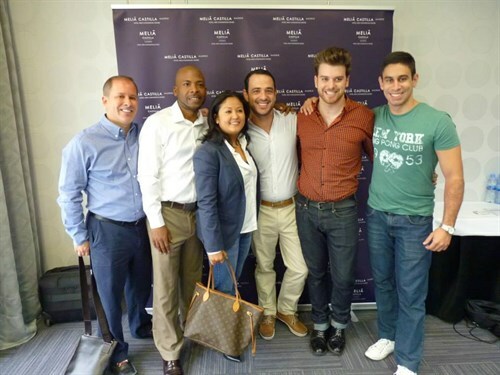 The IGLTA Foundation provides mentorship for the next generation of LGBTQ+-welcoming travel professionals. 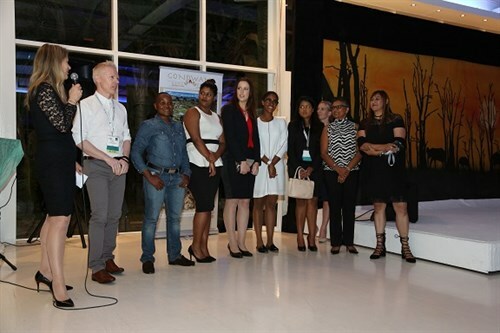 Each year, the IGLTA Foundation provides financial support for travel and accommodations for the IGLTA Annual Global Convention for tourism/hospitality students in the convention host country and LGBTQ+ small-business owners in the tourism industry, particularly in destinations lacking LGBTQ+ tourism support and/or with anti-gay governments. Participation in the Annual Global Convention provides these students and small-business owners with education and mentorship that would otherwise be unavailable to them. A Board of Directors governs the IGLTA Foundation, overseeing the organization's strategy and direction. Click here to read our bylaws. Pictured left to right: Thanakarn (Bella) Vongvisitsin, The Hong Kong Polytechnic University; Marco Briganti, Ryerson University; John Chervy Rosal, Centennial College; and Nicholas Tremblay, Ryerson University. 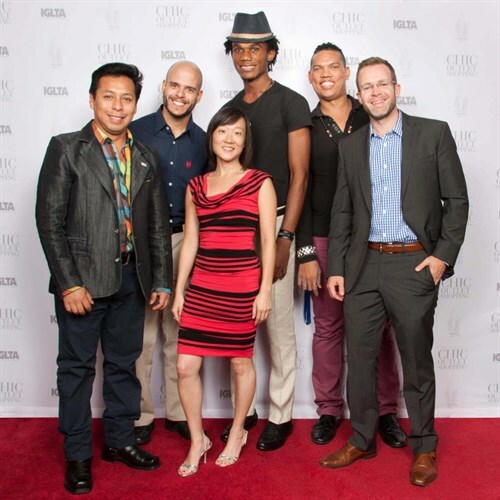 Pictured left to right) Michael Gladwin, Edenvale, South Africa; Katherine Vielman, Hollywood, Florida; Khari Grant, Orlando, Florida; Junqi "Vincent" Weng, Zhejiang, China: John Sakakini, Washington, D.C.
IGLTA board member Rika Jean-Francois with Annual Global Convention scholarship recipients (L to R) Vidar Nilsen (Norway), Hlengiwe Buthelezi (South Africa) and students from the International Hotel School in Cape Town. 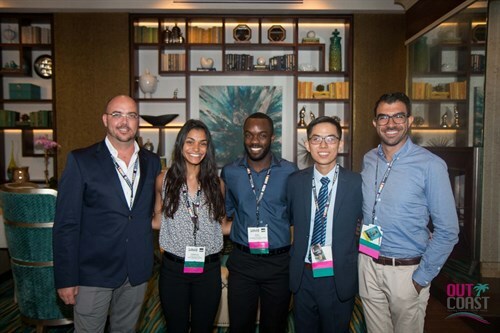 Scholarship recipients (L to R) Wang Hao (China), Ena Yanagi (Japan), Olubode Shawn Brown (Jamaica), Kan Kikumoto (Japan) and Fabio Rugeles (Colombia). The IGLTA Foundation subsidizes association memberships for small LGBT-friendly tourism businesses in emerging destinations, i.e. places that lack governmental support or LGBTQ+ infrastructure. Since the program was launched 13 October, 2013 we have added members in Montenegro, Romania, Serbia, Cambodia, China, Indonesia, Singapore, Sri Lanka, Vietnam, Colombia, Ecuador, Peru, Trinidad, and Jamaica. As the Foundation grows, we plan to expand these efforts to include Annual Global Convention registrations along with travel expenses and tables in our Unique Destinations trade show. Assisting in the professional growth of future LGBTQ+ tourism leaders worldwide helps to make travel more welcoming for us all. Whether it is $5 or $5,000, your donation will help improve the LGBT travel and tourism industry and worthy projects globally. All donations from US Citizens are tax deductible in accordance to the laws of the United States. Spread the word and "Like" us on Facebook! Amazon.com will donate back to IGLTA Foundation at no cost to you! For more information, please contact info@igltafoundation.org.